Lancashire all-rounder Kyle Hogg has retired from cricket with immediate effect because of a back problem. 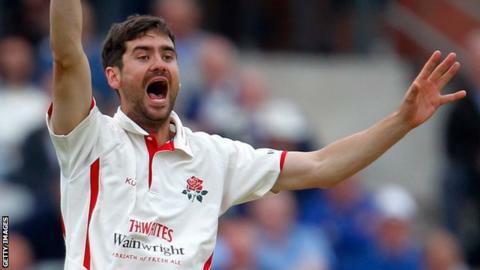 The 31-year-old took 60 County Championship wickets at an average of 18.41 last season to help Lancashire win promotion from Division Two. In a 114-match first-class career, he took 280 wickets and scored 2,708 runs. "It has been cut short, but I've achieved a lot more than people have done in their careers," Hogg told BBC Radio Lancashire. "When you look at all the names that had gone before me at Old Trafford, a majority of them never won the Championship. No one can ever take that away from me. Hogg succeeded where both father and grandfather failed by helping Lancashire win the County Championship title in 2011. Hogg's father Willie spent four seasons in the late 1970s trying in vain, just as his granddad, West Indies Test legend Sonny Ramadhin, had in his one season at Old Trafford in 1964. "Over the past three years I've struggled with my back, I've gone down the rout of painkilling injections and all of that. This year it has been the build-up of a lot of other things and it got to a stage where I saw the specialist and he said, 'I think your time is up, put your ball and boots in the bin or give them away'. "Even if you are thinking it, once the actual words come out of someone else's mouth it is a big shock. "I can look back fondly and get on with the next stage of hopefully staying involved in cricket." Hogg, who took 50 wickets in 2011 at an average of 18.80 to help them win the title, featured in eight Championship matches this season, taking 21 wickets. Lancashire's One-Day Cup win over Derbyshire last month was his last appearance. He made his Lancashire debut in 2001 and has taken five wickets in a match eight times, 10 wickets twice and scored 16 half-centuries. Lancashire director of cricket Mike Watkinson said: "He is at a stage of his career where he has so much to offer. "It is bad news for Kyle and bad news for ourselves, because he would be looking to play for another five, six or seven years or, by watching Glen Chapple, maybe another 10 years."